A magnetic base makes the base levitate and spin. It has been designed to not only look elegant for the purpose it serves, but also sensible in approach and use. The bowl is splash-proof letting you water your plants in it and letting you nurture a live plant indoor. We have made sure the design aesthetics don’t compromise the much needed features in a product of this nature. 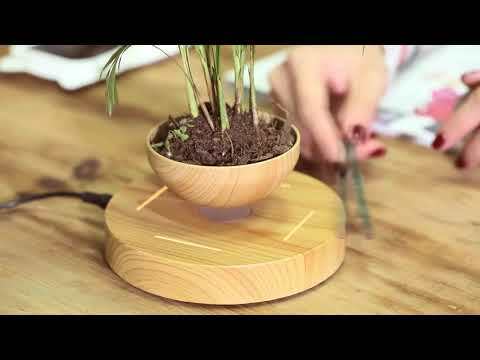 Simply take the bowl off levitation mode, water your plant and have it up and spinning again in no time. It lets you nurture a small plant of your choice in your living room, making it beautifully levitate – something never done before. Not only can you have the plant sit right next to your bed or by your study table, you can have it sit at the window sill. No matter where it is placed it’s assured to give you a relaxing feel every time you see it levitating and spinning gracefully.